The hubs spent a lot of time redesigning the blog to give it a fresh makeover - and doesn't it look good?? There were a couple of iterations along the way but I'm in love with the new look and I hope you like it, what do you think? I'd love to know in the comments. I was contacted by BBC Radio West Midlands regarding the financial results of Marks and Spencers - they were going to be discussing the results live on air and had seen my previous posts about M&S fashion (see here and here) and wondered if I would agree to be one of the interviewees on their morning radio show. This was odd as a) I wouldn't call myself a fashion blogger b) I don't live in the West Midlands and c) I'm no expert in fashion retailing! But like most people I have an opinion on M&S and especially their clothing (well everyone loves their food right?) so I thought why not? The segment was fine I was interviewed alongside a bona fide retail expert and I don't think I made too much of a fool of myself plus it certainly made for an interesting start to my Thursday morning!! Last night the hubs and I decided to venture out for dinner, he's been craving Nandos for a while now so we trekked over to our nearest one (about a 15 minute drive) unfortunately being Saturday night it was heaving and the wait was nearly an hour. Hunger won out and we decided to investigate a Thai restaurant I've walked past more times than I can remember but never been in. And I'm so glad we did!! The atmosphere was super relaxed and the food was incredibly good and excellent value, the service was slow but overall this was a big win from an impromptu night out!! I wrote on Wednesday about my current obsession with the American TV show The Good Wife (see here) well I've managed this week to watch the entire first season (I LOVE Netflix!!!!!) and I've started Season 2 it's just addictive. I love the characters, the scenarios, the escapism of thinking if only I'd gone to law school this could've been me (just go with it it's escapism remember)....plus for a nice change the female characters are especially well rounded and realistically written. Plus I'm totally drooling over their office attire, shallow but true!! 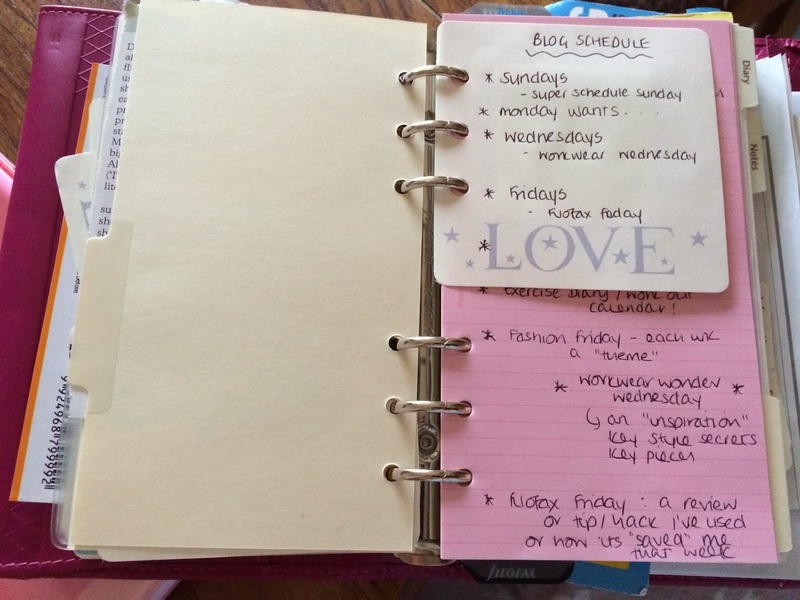 As the blog is now a key focus area for me I thought I'd share my blog post planning organisation...that makes it sound posher than it is but what I have done is set aside a section in my Filofax for blog planning. There is a specific tab in my Projects sections that is just for my blog schedule, ideas about future posts and notes about the blog. I have the Projects section right at the front of my binder, ahead of my calendars as I refer to it a lot and want it easily accessible. I then write in my calendar (Week on one page with notes) the posts and whether they are scheduled or to be written this way I know what is planned and what is yet to write or completed already! With a New Year Resolution to keep I'm aiming to be super organised with the blog to fit it around working full time as well. Wardrobe Plan: I've tweeted these before, I do find it easier to plan what I'm wearing in advance so I don't spend wasted time in the mornings wondering where an item is (or having to iron things ugh I hate ironing!!) Considering the monsoon like conditions Dorset has been having it's all about practical footwear and warm layers...not glamorous but completely essential! So there we are the first Schedule Sunday, it goes to show I certainly still have the ability to ramble that's for sure! I'd love to know what you are all up to over the upcoming week! !